Home - Mark Brown French Polisher. Traditional French Polishing. June 2018. This is a new site, more info and images will be added soon. Using only the best quality natural materials, and traditional hand polishing methods, Mark will sympathetically French polish and restore your antique furniture, snooker tables and pianos. On-site French polishing is also available. Mark is experienced in French polishing and antique furniture restoration, and all work is carried out to the high standard our customers have come to expect. Clients include trade and residential customers. Please see our services page to view polishing services available. 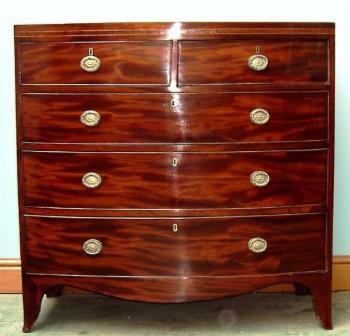 A bow-fronted mahogany chest of drawers, traditionally French polished.